We love coffee! 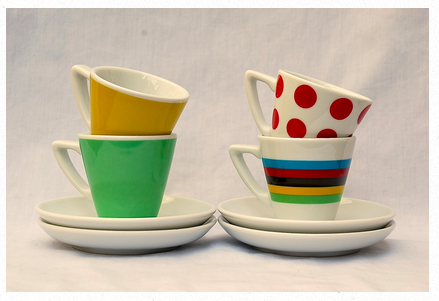 Coffee & Cols have a wide selection of espresso cups with a cycling design and here are their great Tour de France cups. Set of four cups, £36, or if you only want, say the polka dots, they’re £9.95 separately. But my all-time fave has to be the velodrome cup. If you wanted to mix and match, a set of any four espresso cups cost £36. 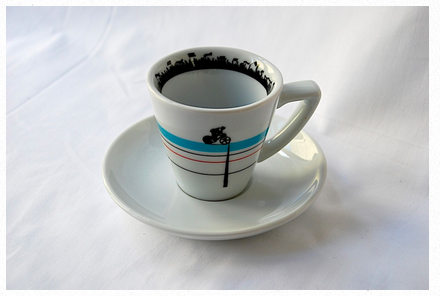 They also have a few cappuccino sized cups with Velodrome and Jerseys designs at £12.95 ea (excluding P&P). Visit Coffee & Cols for more info and to order. Oh! And they also sell coffee!